Democratic New York Sen. Kirsten Gillibrand is among the myriad of Democrats seeking the party’s nomination for 2020. Speaking at a restaurant in Dover, Delaware, Gillibrand set out to monger old fears about the Trump administration having control over low-yield tactical nuclear weapons. In doing so, she foolishly revealed that the last person who should have their finger on the button is her. Tactical nukes are small warheads and delivery systems intended for use in a limited strike in order to devastate local targets without causing widespread collateral damage. 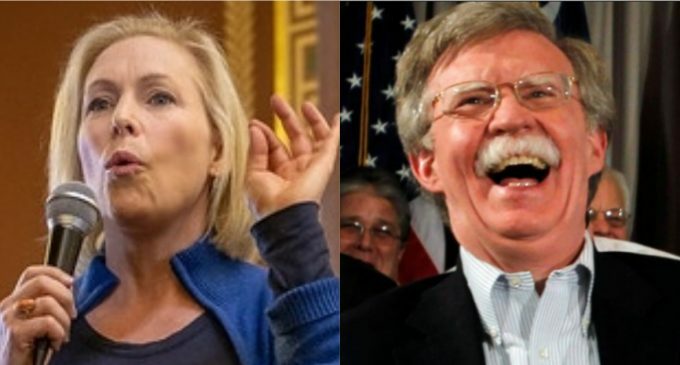 They mostly serve as general deterrence for enemies and rivals to engage the U.S.
On Wednesday, White House National Security Adviser John Bolton was a guest on radio show host Hugh Hewitt’s show when the subject turned to remarks made by Sen. Kirsten Gillibrand (D-NY) nuclear weapons that sent Bolton into a laughing fit. Referring to nuclear weaponry as ‘tactile’ put her utter ignorance on the subject on full display, not to mention her obvious willingness to portray herself as an expert on a subject that she obviously knows little to nothing about.